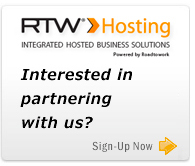 RTW Hosting are looking to expand its already growing reseller base to meet the business demand from the rapidly growing cloud computing market, therefore, we are looking for resellers who wish to win new customers and drive new incremental business into their existing customer base using RTW Hosting's unique integrated hosted platform and provisioning dashboard. If you're an IT reseller, IT management company or systems integrator, then our partner programmes will allow you to resell our on-demand business services - presenting your customers with services of unparalleled quality and you with great margin opportunities with no investment. Our platform offers true flexibility, full automation and a foundation on which to provide cloud services. Fill in the details below and a channel specialist will be in touch shortly.